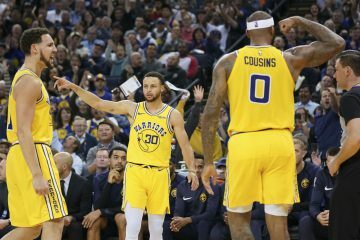 The match-up between the Golden State Warriors and Los Angeles Lakers should have been one of the most anticipated games to end the regular season. The game was on TNT, so the whole nation would witness LeBron and the Lakers measure up against arguably the greatest starting five ever assembled. 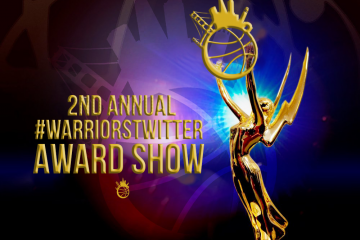 It didn’t turn out to be that way and everybody was disappointed, except for Warriors fans. The Warriors were facing the JV Lakers squad since all of their key players have been shut down for the rest of the regular season. With the Warriors entering playoff mode and the Lakers counting the days until the draft lottery, this game was boring and one sided from the moment the ball was thrown in the air. 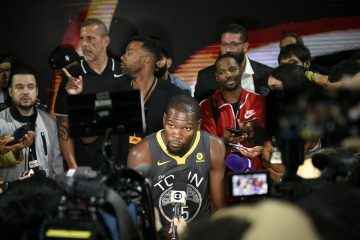 The game ended up being a massacre and the Warriors showed a glimpse to the rest of the NBA what they are capable of on both ends of the floor. Klay got things started for the Warriors by hitting his first shot beyond the arc. Warriors looked good to start the game and with the Lakers so hobbled at the end of the year, this could have gotten out of hand very quickly. 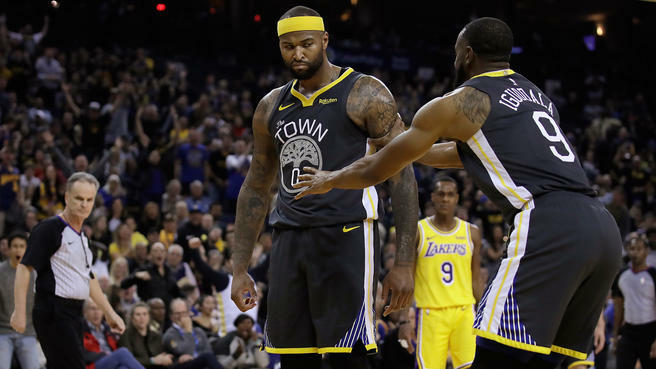 The Warriors were controlling both ends of the floor, scoring at will offensively and making it very difficult for the Lakers to get buckets. After six minutes of play, the Warriors were in control 22-6 and it was a collective effort from the starting 5. It seemed as if the starters didn’t have to suit up for the second quarter, let alone the second half. The Warriors looked like they were in playoff mode already, sniffling the Lakers on defense and holding them to 21.1% at the 3:56 mark. Things have officially gotten ugly. For the die hard Laker fans in attendance, this must have been hard to watch. After one quarter, the Warriors took the life out of the Staples Center and led 39-12. Fun fact Steph Curry was scoreless in the first quarter. Former Gonzaga Bulldog Jonathan Williams gave the Lakers two quick baskets, but the lead was still over 20, so there was nothing to get excited about. Quinn Cook broke the spell for the Warriors with some baskets of his own and thanks to his production, the Warriors lead was safe and sound. The Lakers helped their cause by missing a lot of shots, they were never in a rhythm offensively. The Lakers finally were able to string together a few baskets to make the lead 17 as the half was winding down, but realistically it never felt like the Warriors were in danger of losing their lead. Just as the Lakers had cut it to 15, Curry decided to join the party and knock down his first triple of the game. while the Lakers were down 18, the home fans were treated to a Alex Caruso dunk that for all of their fans out of their seat. Quinn Cool led the way in the second quarter, scoring 12 points in the quarter to give the Warriors a 60-42 lead at the break. Draymond Green and Klay Thompson got things started for the Warriors in the second half, quickly pushing the lead to 23. Just like the start of the game, the Warriors were manhandling the Lakers on both ends and the lead ballooned to 28. I would describe the rest of the quarter, but it was simply a complete massacre. Steve Kerr left his starters for the first 7-8 mins of the quarter and they dominated. They were moving the ball efficiently and DeMarcus Cousins had a nice stretch where he hit a triple and then came right back for a transition dunk. This team is scary and this is probably the best basketball they’ve played as of late. Again, the thing to look at here is that Steph only had 7 points after 3 quarters. That is just absurd, the Warriors didn’t even need his services tonight. Most of the starters were on the bench to start the 4th quarter with the exception of Klay Thompson. 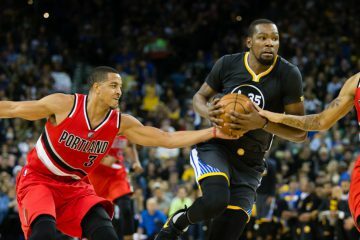 At this point, both teams were trading baskets and the lead kept going from 26-28, so Kerr was able to give his guys plenty of rest. At this point, the Lakers were doing everything they could to make the final score respectable. It’s one thing to lose by 15-20 and an entirely different thing to lose by 30. The Lakers were able to get a moral victory and cut the lead to 18 to end the game. On a night that Curry only scored seven points and shot 1 for 9 from behind the arc, the Warriors still dominated. Boogie Cousins led the way with 21 points and 10 boards. Quinn Cook was the second leading scorer with 18. The Warriors have four games left, three of them against teams with losing records. Unless something drastic happens, the Warriors have locked themselves in for the number one seed in the West.